Ekua lives to make people happy. 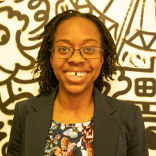 A career chameleon, Ekua started her career as a personal assistant to a Director working in the UK Civil Service, working with numerous Government Departments the Cabinet Office, Home Office, Department for Transport and Department for Digital, Culture, Media & Sport and left as an IT Project Manager. As part of her tenure during her Civil Service career she delivered digital transformation and was part of the award winning team that transformed the UK’s voter registration system from paper to an online service. Whilst working in the Civil Service she founded 2 startups, Layover Adventure and the Hackathon Queen. She left the Civil Service and became a Digital Project Manager contractor. DrinksBot was founded in 2018 and provided an on-demand craft drinks service that successfully delivered to customers. Ekua having learnt many valuable lessons from running her own company will now be focussing on her ability to build customer relationships and digital communities to enable growth at other start-ups. An avid runner, Ekua successfully completed the London Marathon in 2018. She was also awarded a ticket to Barack Obama’s acceptance for the nomination to the Democratic party for her campaigning work for the civic voluntary organisation DCVote.